On Sunday morning New Zealand time (21st April, note that the product became available on the subscription site for download on the 18th & the press embargo ended on the 19th) I saw the first sign that Autodesk had deviated from the information inferred on their website and the Vault Wiki help pages. I discovered this while reading Brendan Henderson‘s update blog post, where he shares the knowledge gleaned from his reseller. What it amounts to is the resurrection of Autodesk Vault Workgroup & the removal of the free upgrade from Vault Workgroup to Autodesk Vault Professional. Oleg’s response here is interesting, since it highlights the positive side to this decision. Invariably upgrading all the Workgroup customers to Professional will eventually lead to an increase in subs for those customers. The VARS would have bore the brunt of this for sure, so its in their interests & those of customers not willing to pay the extra subs per seat per year. In addition, when you take a look at the feature comparison chart Vault Workgroup as a feature set, sits smack bang in the middle of Vault Basic & Vault Professional. Most of Vault Professionals’ features above those of Workgroup are more beneficial for medium to large design offices or companies with a manufacturing capacity. So in these respects Autodesk’s smaller change in the product editions is a good thing and will no doubt please a lot of customers. 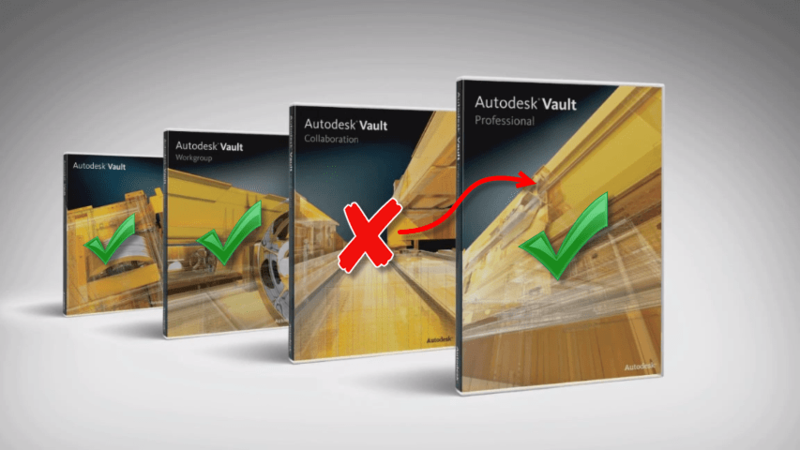 The problem is a lot of Autodesk Vault Workgroup customers will have already been told they’re going to be upgraded to Vault Professional and Autodesk’s Vault Product webpage supports that view. In some countries I’m sure they will have to honor the upgrade on the basis of that’s what they have advertised at the time of launch. The lack of clear information surrounding the Vault product family during this years Autodesk Launch season gives me the Heebie–jeebies. Frankly it’s disappointing and I hope it isn’t a sign of the product pending retirement, in favour of an Autodesk 360 based solution (I doubt this is the case just yet). Maybe this poor communication of new products/features is just a function of an online product launch….. Going back to my opening sentence, there’s a lot to be excited about in this years release of Vault Professional 2014. Some of it I’ve already covered in the What’s New post a couple of weeks ago. But check back in with D&M towards the end of the week to find out what I’m particularly excited about. As a final thought, maybe Autodesk should instead leave the door open for customers to decide if they want the free upgrade & pay more subs or stay where they are. This might be the fair thing to do instead of the ‘now you see it, now you don’t’ approach. The uncertainty will remain until Autodesk release an official statement about their intentions. All I can say is I’m glad I’m already a Vault Professional customer and not a Workgroup one.